Following another banner year for the popular Summit SuperSeries presented by AMSOIL and Summit Team Finals presented by AMSOIL programs, the International Hot Rod Association (IHRA) is excited to announce its Summit Team Finals schedule for the 2014 racing season. 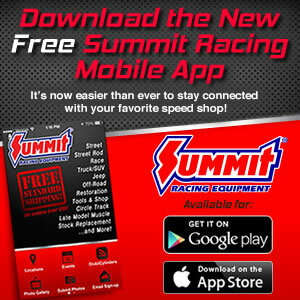 Designed to give local racers an opportunity to compete on a national stage, the Summit SuperSeries and the Summit Team Finals events have grown each year since its inception in 2002. Today, thousands of racers from across North America compete at their local track for an opportunity to advance to the Summit Team Finals for a fun weekend of fellowship and competition. Each year tracks all across North America advance a team of racers to their local Summit Team Finals event to compete for individual and team prizes. Each Summit Team Finals event also advances a set number of racers in the Top, Mod and Junior Dragster classes to the Summit World Finals with over $200,000 in cash and prizes on the line. This year’s Summit Team Finals schedule spans seven states and Canada beginning in late August and running through early October. The IHRA season will culminate with the IHRA Summit Racing Equipment World Finals October 10-11 at Memphis International Raceway. The 2014 Summit Team Finals will get underway at Castrol Raceway in Alberta, Canada with the Division 6 Border Bandits competition the weekend of August 15-17. The Division 5 Thunder competition will take place the weekend of September 12-14 at U.S. 131 Motorsports Park in Michigan, joining the Division 7 Gunslingers Summit Team Finals that same weekend at Caprock Motorplex in Texas. The racing season will quickly pick up the weekend of September 19-21 with a pair of Summit Team Finals events. Carolina Dragway will host the Division 2 East Summit Team Finals while Pittsburgh Raceway Park will host the Division 3 North Stars in mid-September. Two more races will bring September to a close as the Division 4 Renegades Team finals at Dallas Raceway and the Division 9 Raiders Team Finals at Piedmont Dragway take place the weekend of September 26-28. The 2014 Summit Team Finals season will wrap up with a pair of events the weekend of October 3-5 as Piedmont Dragway hosts its second race weekend in a row with the Division 1 Patriots and Memphis International Raceway hosts the Division 2 Heat Wave West. The full Summit Team Finals schedule can be found below. For more information on the IHRA Summit Racing Equipment Team Finals and Summit SuperSeries please visit www.ihra.com.